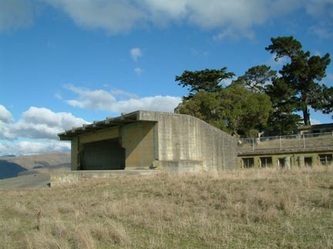 The Godley Battery consisted of three emplacements, constructed across the crest of the Godley Head, each with individual underground magazines. Originally only two emplacements were planned (E1 and E2). Work began on these in 1940 but construction was well advanced when there was a major addition to the schedule. The Army Council had decided to bring all counter-bombardment batteries up to a three gun standard. The magazines for E1 & E2 were constructed by a cut and cover process. Each had a large reinforced concrete overhead cover called a ’burster slab’ which was designed to protect the magazine from shell fire. In addition, they were also surrounded with a narrow blast tunnel which was intended to dissipate the shock of nearby shell bursts from the magazine itself. A shortage of steel reinforcing posed problems for the construction of the E 3 magazine. A similar problem was faced in Auckland at Whangaparaoa and Motatapu, as well as Wright’s Hill in Wellington. It was found that the necessary protection could be obtained by mining the rock to a depth of 12 meters. Thus, the construction of the E3 magazine was of the tunnelled-out type. It was sunk deep into the bedrock of the Head and lined with concrete, its floor being 12 metres below ground level. 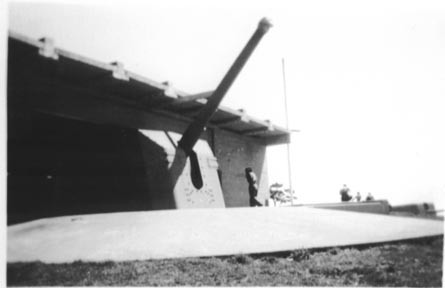 The first two emplacements and magazines were completed with the guns installed by July 1942. 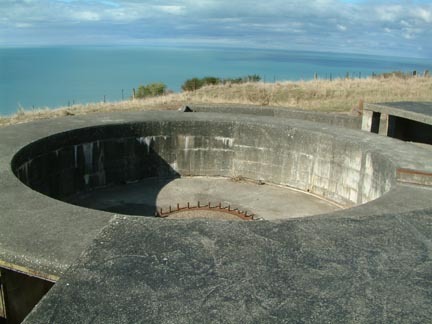 The third emplacement and magazine was structurally complete in 1944, but the gun which had arrived in 1943, was not installed until 1946, apparently due to a lack of specialist personnel. The magazines were divided into cartridge and shell stores with a capacity of 800 shells each. All three had 1,000 volt DC motored continuous belt hoists for lifting the ammunition to the guns. The hoists were also used to stock the magazines. All magazines were equipped with emergency evacuation shafts. 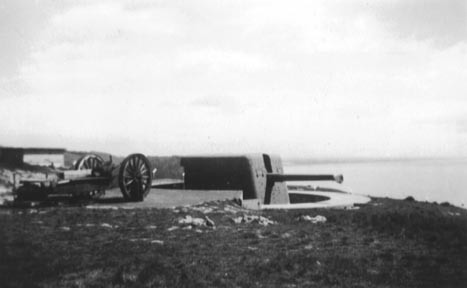 All three guns were 6″ breech loading Mark XXIV Coastal Defence guns on Mark V 45° mountings. They were protected by ¾ steel-plate turrets and mounted in en barbette (literally, over the edge) concrete positions. 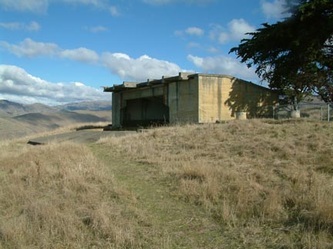 Each gun had adjacent equipment stores and war shelters for the gun crews to the rear, which were constructed at the same time as the batteries. E1 and E2 had concrete Colchester style overhead covers. These while protecting the guns, restricted their arc of fire to only the main seaward approaches to the harbour. Auto sights BL 6" The third gun in common with Motutapu and Palmers Head batteries, had no overhead cover which allowed it a theoretical 360° field of fire. However the ability to land a shell amongst the hills of Banks Peninsula would probably be of limited value. Mark V were installed on both.